Dr. Mohammed Monkez Alwani completed his Doctor of Medicine (MD) from University of Marburg, Germany in 1998 and thereafter completed his specialist training in Emergency Medicine from the Medical Council of the state of Hessen, Germany in 2006 and his specialist training in Surgery also from Medical Council of the state of Hessen, Germany in 2004. In 2010 Dr. Alwani completed his training in Orthopaedics and Traumatology. Dr. Alwani has over 17 years of experience in Orthopaedics and has worked various hospitals in Germany such as City Academic Hospital in Frankenberg, University Clinic in Marburg and Elisabeth Clinic in Olsberg amongst others. 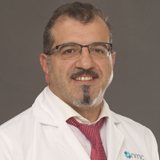 Besides this Dr. Alwani has attended various international conferences, certificate programs and workshops on Joints Arthroscopy and Traumatology of Pelvis/Acetabulum across Europe. His key area of interest Shoulder Arthroscopy, Knee Arthroscopy, Joint Replacement Surgery and Trauma. He can converse with his patients in German, English and Arabic.